12 pages in PDF format, full of detailed analysis and photos . . . 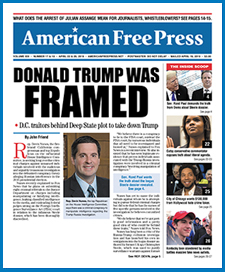 In 1975, AMERICAN FREE PRESS is the newspaper that put the shadowy Bilderberg group on the map, led by AFP Editor Emeritus James P. “Jim” Tucker, Jr. (now deceased), and in that great tradition we have faithfully carried the torch, and continue to provide special on-the-scene coverage of the elite gathering. And we do it every year. Here it is, AFP’s Special Bilderberg 2015 Report, prepared in digital format to allow you easy access to this newspaper’s full coverage of the event that took place in Austria this year. Did Bilderberg Crown Jeb Bush Next President at Bilderberg? WILL YOU LISTEN TO RON PAUL?